The 1983 NBA draft took place on June 28, 1983, in New York City. A total of 226 players were selected over 10 rounds by the league's 23 teams. 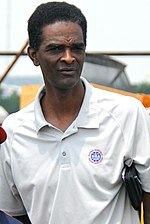 At least four players from the 1983 draft later served or now serve as coaches. One served at a major-college program—Craig Robinson (who never played in the NBA) at Oregon State—and two in the NBA—Doc Rivers for the Los Angeles Clippers and Randy Wittman for the Washington Wizards. Another player, Byron Scott, coached for the Los Angeles Lakers from 2014 to 2016. While Scott won the Coach of the Year award in 2008, Rivers won an NBA Championship with the Celtics in that same year (it could be also noted that Rivers won that award prior to Scott, in 2000, while he was still coaching the Orlando Magic). Robinson, who led the Beavers to the 2009 College Basketball Invitational title, has an additional claim to fame as the older brother of former First Lady Michelle Obama. Sidney Lowe coached at North Carolina State from 2006 to 2011. Manute Bol was selected in the 5th round by the Clippers, but the NBA rejected the pick on technicalities. Manute had never filed draft paperwork, and his passport listed him at 19 (at the time, 19 years was too young to be drafted). Florida State star Mitchell Wiggins, father of future No. 1 overall draft pick and Canadian Andrew Wiggins, was drafted 23rd by the Indiana Pacers. Leo Rautins, current colour man for Toronto Raptors broadcasts, made history as the first Canadian drafted in the first round of an NBA draft. 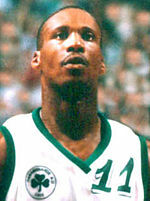 Rautins, one of the greatest players to ever come out of Syracuse University, had his career cut short by injury. He would later go on to coach Canada's senior men's national basketball team. Despite there being only 23 teams at the time of the draft, the Cleveland Cavaliers were awarded the 24th pick out of courtesy. Then-owner Ted Stepien was infamous for repeatedly trading first-round picks in the late 1970s and early 1980s, which, considering Cleveland's morose records in that time period, eventually culminated in the NBA creating a rule banning teams from dealing all of their first-round picks in consecutive years. 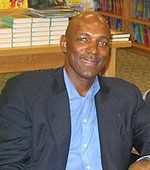 Clyde Drexler was selected fourteenth overall by the Portland Trail Blazers. *Compensation for draft choices previously traded away by Ted Stepien. These picks have played at least one game in the NBA but were not selected in the first or second rounds. "Complete First Round Results 1980-89". NBA.com. Turner Sports Interactive, Inc. Retrieved December 11, 2010. "1983 NBA Draft". basketball-reference.com. Sports Reference LLC. Retrieved December 11, 2010. ^ a b "A Gift From On High". CNN. June 28, 2010.